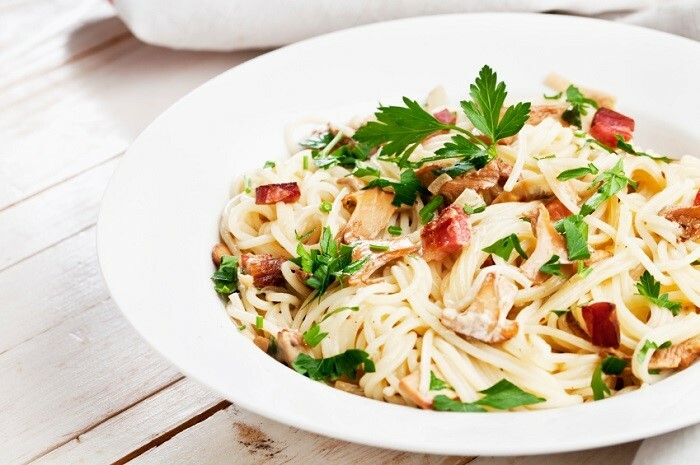 Pasta with Wild Mushrooms is an easy to make pasta recipe sent in to us by Federica, a site visitor, whose family was originally from Piedmont. 1) Combine the dried porcini and the wine in a cup or small bowl and soak for thirty minutes. 2) Fill up a great big pot with four to six quarts of water and bring the water to a boil. 4) Add the butter and allow it to melt. When the bubbles have subsided, add the fresh mushrooms. Saute the mushrooms until they have given up their juices and the juices have all but evaporated. In the meantime, when the pasta water boils, add the pasta to the water and stir. 5) Raise the heat to high and add the porcini and wine. If you've cooked the fresh mushrooms in two batches, combine them now. Add in the shallots, the thyme and the saute, stirring frequently until the wine has nearly evaporated. Add salt & pepper to taste and the cream. Allow to boil until it has reduced and thickened. Remove from the heat. 6) When the pasta is al dente, drain and pour onto a plate, or divide it among four dishes. Either pour all of the mushroom sauce over the pasta in the platter, or spoon a quarter over each of the dishes. Garnish with the chopped parsley. Pasta with Wild Mushrooms should be served immediately.